Everyone is getting social these days. Be it Facebook, Twitter or the very recent Google Plus, users are flocking towards social sites to engage with friends, family members and people they care about in real life. As a web marketer, you can no longer ignore social networking sites, because the numbers are growing every single hour. Building your own social networking community is a challenging task for newbie marketers. Sure you can leverage the power of Facebook and Twitter but then, it is not your social community and you are restricted by the laws governed by them. If you want to create your own social networking community which supports both mobile and tablet devices, try the Boonex Mobile social software platform. Boonex is a one of a kind social development platform which allows you to create feature rich applications for both iPhone and Android operating systems. You don’t necessarily require coding skills as Boonex allows you to customize, brand and submit your applications to the respective app stores (iTunes and Android App market) from an intuitive and easy to use web interface. Boonex Mobile Apps are tightly packed with Dolphin, which is another proven platform for creating social communities on the web. Users can register their member accounts, set up profiles and participate in friend browsing. Users can send and receive private messages in their social mail box. 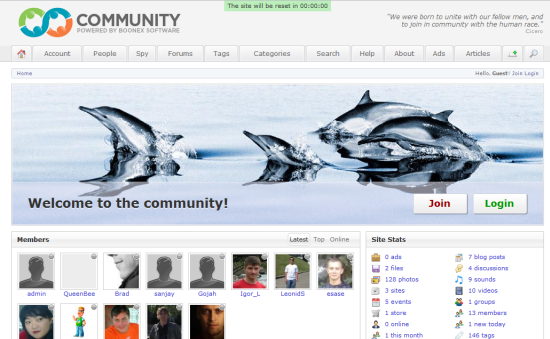 Dolphin allows users to post status updates and links on their profiles. Dolphin’s mobile applications also supports out of the box photo and video uploads, so users never have to worry about using external applications or utilities for online media management. Support for GPS location based features, multilingual interface and the ability to accept or decline friend requests. To get a completely customized and branded application made from Dolphin, you have to buy either the Prime or Enterprise packages. The Prime suite combines the power of Dolphin Smart Community Builder, Mobile rebranding licenses, Unity memberships, and installation service to get your site or mobile community launched, keep it running without worrying about additional maintenance hassles. However, if you want to launch a network of social sites and communities, the Enterprise suite will be a good choice. The Enterprise package includes three full Prime licenses and a professional server audit to ensure optimal performance of your Dolphin sites.